Want to convert M4A to MP3 or vice versa? If you receive some music or an audio recording in the unfamiliar M4A format, don’t be concerned: it’s just a variation of the well-known MP4 or MPEG-4 format suitable for audio files with no video track. However, this MP4 variant is nowhere near as popular as its “big brother,” so you may encounter problems trying to play M4A files on your multimedia device or even your computer. The problem is easily solved by converting the M4A file into the standard MP3 format. 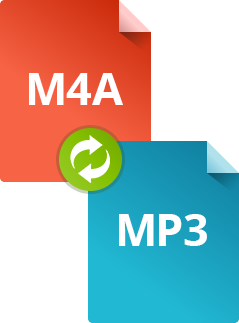 Although converting M4A to MP3 is not a complicated task, you do need a fast music converter to do the job efficiently in a short period of time. 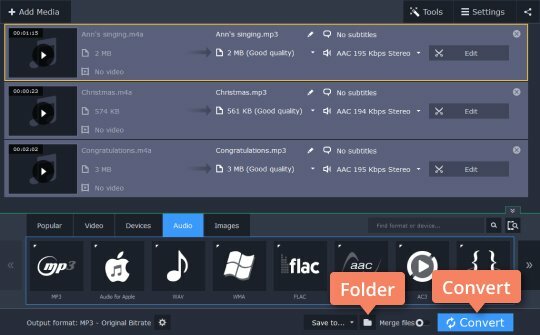 Movavi Video Converter for Windows and Mac fits these requirements and actually makes the task even easier: this ultimate multimedia software supports all possible sound formats from OGG and AAC to FLAC, Monkey's Audio, and, of course, M4A and MP3. 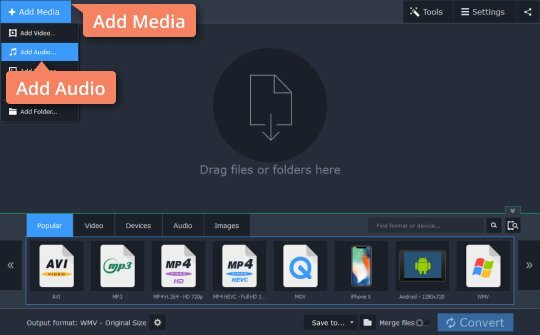 Download Movavi Video Converter to turn your computer into a mini encoding studio and transfer your audio collection to a standard MP3 format. Download the installation file, open it and install the program following the setup instructions. Click the Add Media button, then Add Audio and choose the audio files you want to convert to MP3. Movavi Video Converter supports batch processing, so you can add multiple files and convert them all in one pass. Open the Audio tab. 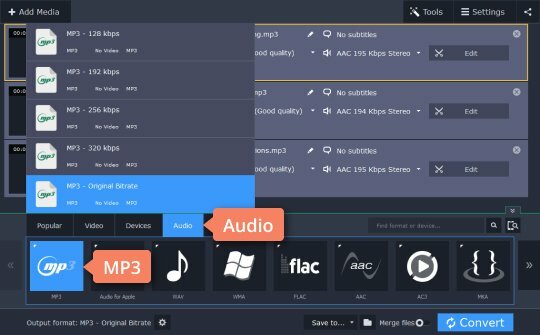 Find the MP3 group and choose one of the available bitrate options. If you're not sure which one to use, just select the MP3 - Original bitrate preset. You can also opt for a lower bitrate to make the output audio files smaller. Check the Save to section and change the output folder if you want to save your files in a location other than the default Movavi Library folder. Then, click Convert to start processing. Once the conversion is done, the destination folder will open automatically.